As a place famed for shipbuilding, left political leanings and the propensity the locals have of calling a spade a shovel, Govan in Glasgow isn’t exactly the kind of place we might associate with ghosts and spooky phenomenon. Only a few stories have made it into paranormal literature. One of these is the case of the poltergeist that paid a short visit to a fourth floor tenement flat at 5.30 one evening during the 1960s. It was witnessed by Paul Anderson, who described what happened to Ron Halliday, who subsequently recorded it in his 2008 Haunted Glasgow. A crucifix hanging from a chain on a wall violently twisted itself, hitting a calendar pinned next to it, then stopped. Such is the fleeting nature of the poltergeist. Another well documented story is the strange disappearance of 19 year old Alex Cleghorn on Hogmanay 1966. He was walking along Govan Road with his brothers in the hope of a ‘wee swally’ to see in the bells, when he simply disappeared into thin air. According to the Paranormal Database, some locals attributed the disappearance to faeries. Tom Rannachan, a Scottish medium, is a Govan lad. He noted some of his experiences around the area in his book, Psychic Scotland. Growing up, he lived in a small flat in Langlands Road, where he became friends with the ghost of a young boy named Andrew. In time, Andrew disappeared and was replaced by two less friendly child ghosts, who tormented Rannachan, who attributed the death of his puppy to the ghosts. In the 1990s, Rannachan visited the Govan community centre, the Pearce Institute on Govan Road one lunchtime. Sitting in the theatre, he encountered the bearded ghost of an old man sitting behind him. The ghost quickly vanished. Other events Rannachan can recall is a ghost of an old man in an oily flat-cap vanishing outside a pub one evening. Rannachan’s uncle used to wave to an elderly woman watching the world go by from her tenement on his way into work during the 1950’s. It later transpired that the woman had killed herself months before. However, asking around, it’s quite surprising what you hear. Some of the best tales relate to the Pearce Institute, a treasured community centre that has been a lifeline for generations in Govan. Experiences range from flickering lights, a disconnected organ playing in the main hall and the flitting shadow of what is believed to be the ghost of Lady Pearce, who gifted the building to Govan in the first place. More on the Institute’s ghostly tales can be found in great detail in another Spooky Isles article. Another reputedly haunted building is the former Greenfield Street School, which has lain empty the last few years. It is said to be haunted by a grey lady or black lady), described as wearing a long grey gown. There were some strange sightings, and a janitor described seeing strange shadows when working alone. It’s also curious the stories children come up with, when they claim certain old houses are haunted. One was an old house, called “The Yellow House” stood behind Orkney Street Police Station. There are no specifics, other than the fact local kids were terrified of it and used to dare each other to go inside. The Police Station itself was said to be haunted, though it typical Govan fashion, that turns out to be a story cooked up to scare someone! 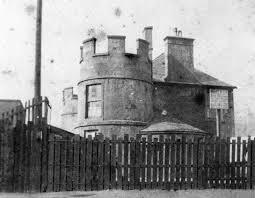 Probably the best childhood ghost story in Govan relates to the Kintra Street or Broomloan Road ‘castle’, a turreted mansion that stood on the junction of Broomloan Road and Kintra Street. Local kids called it the Hunty, apparently an adaptation of the word haunted. Whatever lurked within the Hunty, which had been split up into flats by the mid 20th century, changed down the years. One elderly lady, who had lived in the area as a young girl in the 1940s, mentioned during an oral history project that she and her friends believed it to have a ghost. By the 1950s, the ghost had turned into a witch, though my informant says that when she was small, she didn’t think she knew what a ghost was. She adds that the local kids must have demented the residents of the Hunty mad by running away from the building screaming! The Hunty was demolished in the early 1960s to make way for new housing, which has also recently been knocked down. Finally, a modern story comes from the Queensland flats just by Berryknowes Road. A young father and his partner had some interesting times when they moved into a flat with their newborn daughter in 1999. He was awoken by his girlfriend quickly sitting up in bed and screaming at something to go away. She had seen the silhouette of an old man looking into the crib nodding his head. The shadow vanished at the woman’s screaming. At the same time, the father saw a black shadow swooping by the door. Another time, he also saw a doppelgänger, or double, of his partner, in flat. A split second later, his partner (the real version) was shouting from another room, asking who he was talking to. He went in to see her, and she was wearing completely different clothes. i remember the Hunty from the Fifties when i lived in Kintra Street. my pals and i all thought it was haunted and used to dare each other to climb the stairs inside it. near it, at the junction of Woodville and Kintra Street was the ‘hangin man’, a streetlamp shadow that had the vague outline of a corpse on a gibbet. Thanks Pat, Govan sounds like a real spooky place!